Want to experience the water like a swordfish? Then take a look at the Seabreacher, a light and agile personal watercraft with high performance and an aggressive shark-style body. The patented fully-vectored thrust system of this craft mimics the tail articulation of real aquatic animals like sharks and dolphins. And the Seabreacher can jump 90 degrees out of the water. A decade of engineering and testing have gone into creating the Seabreacher, a watercraft designed to endure the continuous punishment of a marine environment. The crafts sculpted body looks like the mating of a sea mammal and a high-performance jet. Each craft is hand-built to the customer’s specifications and there are a lot of options to choose from. All models are approved for recreational use by the U.S. Coast Guard and can be registered as a conventional inboard powerboat. 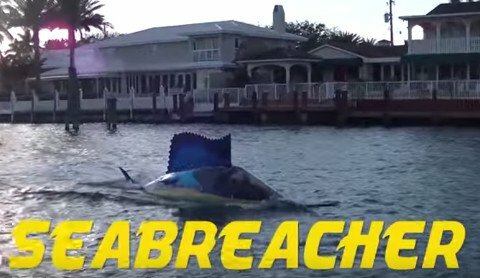 But the Seabreacher is certainly different: it can dive beneath the surface for brief durations – usually to 5 or 6 feet and for about 10 seconds unless your a very experienced driver. The boat is buoyant and engineered to self-right. Because of the cylindrical shape and having heavy wings and engine weight located low in the vessel, gravity pulls it over to right-side up. The Seabreacher operates similar to an aircraft with three full axis of control: pitch, roll, and yaw, so it can carve left and right, jump over, dive under and cut straight through the waves. The X Model features two seats, a Rotax 1500cc engine, 260 horsepower – supercharged and intercooled, high output with low emissions, and a 14 gallon fuel capacity. It has a shark-style body, fully-vectored jet nozzle for maneuverability, high-performance low profile wings, and underwater view ports. Front and rear LCD screens display live video from snorkel-mounted cameras, and the Marine audio system has an iPod/iPhone docking station. And obviously, it’s just cool looking with a custom paint job and upholstered interior. Can you imagine acrobatic aqua tricks…diving, jumping, rolling and porpoising through the water from inside the cockpit of a craft that pushes the limits? If you’re a person with a need for speed that won’t mind being the center of attention, maybe it’s time to trade in those jet skis and check out a Seabreacher!